Shiv Sena chief Uddhav Thackeray has demanded that his ministers be inducted in the Devendra Fadnavis cabinet before the new CM takes a confidence vote in the Assembly. Prime Minister Narendra Modi and his team will play a major role in shaping the administration of Maharashtra’s new Chief Minister Devendra Fadnavis. Fadnavis will be guided by the Central leadership of the BJP in the distribution of portfolios to his small Cabinet that was sworn in yesterday. Prime Minister Narendra Modi today asked Union Secretaries to make bold policy moves and innovate as much as possible. 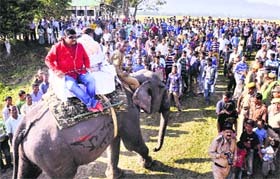 Hundreds of tourists flocked the picturesque rhino abode at Kaziranga National Park in Assam when it was thrown open to tourists for the season in a ceremony graced by Assam’s Forest Minister Rakibul Hussain. The tourist season will last till April 2015. Apprehending foggy conditions in the winter season, the Railways has decided to cancel 30 trains, mostly North-bound, for 47 days from December 31 this year. “Schedules of total 36 trains would be affected from December 31, 2014 to February 15, 2015. New Delhi, November 1 Brushing aside China’s reservations to its plans to develop infrastructure along the border, government today said it has every right to undertake such projects in Indian territory and no one can stop it. New Delhi, November 1 India will tomorrow start destroying its stockpile of seized illegal wildlife articles, including tiger pelts and ivory, to demonstrate the country’s commitment towards protection of its flora and fauna. Battered by a slew of poll reverses beginning from the Lok Sabha elections in May to the last month’s Haryana and Maharashtra polls, the Congress has initiated revival talks with party vice-president Rahul Gandhi assuming charge of rejuvenation. A split in the Tamil Nadu Congress appears imminent with the party today naming EVKS Elangovan as new president for the state unit. More than 24 farmers were injured in police lathi charge and around six policemen hurt in brick-batting when protesting farmers clashed with the police at Gokul barrage in Mathura today. Farmers set ablaze two Uttar Pradesh state transport buses and blocked traffic causing major hardship to commuters. The police had to resort to lathi charge to disperse the protesting farmers. After wrangling over power and water, the Telangana and Andhra Pradesh governments are now caught in a bitter row over sharing funds from public institutions which are now under common control as per the bifurcation act. 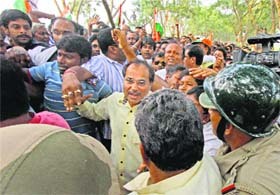 Despite scuffle with the police and a sit-in, a Congress delegation led by the party’s state president Adhir Ranjan Chowdhury was today not allowed to enter the trouble-torn Makra village in Birbhum district, which was made out of bounds for politicians by the Trinamool Congress government. The Left parties today decided to regroup and launch a joint nationwide campaign against the Modi government for the measures undertaken by it. Jet fuel rates were today cut by a steep 7.3%, the fourth straight reduction in prices since August on the back of falling international oil rates. A wooden building housing the office of Deepak Project of the Border Road Organisation (BRO) in the Chauran Maidan area was gutted in a devastating fire that broke out late in the night. Punjab Chief Minister Parkash Singh Badal today met BJP president Amit Shah and expressed satisfaction over the Union government's announcement of an additional compensation for the kin of victims of the 1984 anti-Sikh riots. Shiv Sena chief Uddhav Thackeray has demanded that his ministers be inducted in the Devendra Fadnavis cabinet before the new Chief Minister takes a confidence vote in the Assembly. Sources say Thackeray has been given some sort of assurance in this regard during his telephonic conversation with BJP president Amit Shah and Finance Minister Arun Jaitley just before he rushed to the swearing-in ceremony of the new CM yesterday. A Shiv Sena leader said the BJP has agreed to give 1/3rd of the Cabinet berths to the regional party. However, negotiators from both sides are still stuck on the ministries to be given to the Shiv Sena. “We have asked the BJP leaders to induct Shiv Sena MLAs in the Cabinet before the confidence vote,” a party leader said today. Thackeray is under pressure from party colleagues to name an MLA as the Shiv Sena’s Leader of the Opposition in the state Assembly if the party is not taken in the government. If the Shiv Sena dons the mantle of an Opposition party, the BJP government will be seen depending on Sharad Pawar’s Nationalist Congress Party (NCP) against which it had levelled corruption allegations ahead of the Assembly elections. The NCP has announced that it would abstain from the confidence vote in order to let the BJP sail through. Though the NCP has offered unconditional support, Fadnavis will be under pressure to go easy on the corruption cases against its senior leaders such as Ajit Pawar and Chhagan Bhujbal. Fadnavis has been asked by Governor Vidyasagar Rao to prove his majority in the Assembly within 15 days of being sworn in as the Chief Minister. 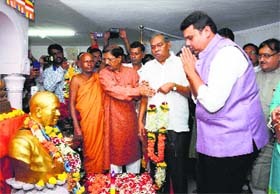 Sources say the Chief Minister will keep the sensitive urban development department with himself like his predecessors. This department oversees the planning of towns and cities across Maharashtra, particularly Mumbai. In the past, the Chief Ministers played a major role in clearing development plans of big real estate projects and Fadnavis is expected to follow in their footsteps. It remains to be seen who handles the sensitive Home Department. In the outgoing government, the Nationalist Congress Party (NCP) kept it with itself. Fadnavis is also pattering the Chief Minister’s Office on the lines of Modi’s PMO. Addressing reporters today, Fadnavis confirmed that he was revamping the CMO on the lines of the PMO. “I am in the process of developing the office of the Chief Minister on the lines of the Prime Minister’s Office where a set of select bureaucrats assist the ministers in case they are unable to carry out certain tasks,” he said. Bureaucrats appointed by the CM in various departments are expected to update him about the progress of various tasks assigned to them. Fadnavis is also expected to implement the Central pattern whereby secretaries of ministers are chosen by the Chief Minister himself. “Bureaucrats appointed to assist ministers will ensure that work is not kept unnecessarily pending,” Fadnavis said. The state government is also expected to get working on streamlining the taxation system by scrapping various levies such as octroi and the local body tax which was mooted by the previous government. The new CM said his government was considering implementing a turnover tax on VAT in lieu of octroi and local body tax. Prime Minister Narendra Modi today asked Union Secretaries to make bold policy moves and innovate as much as possible. He asked the top policy makers to take calculated risks while rolling out government programmes. The Prime Minister is learnt to have told nearly 70 secretaries, whom he was meeting for the second time today, that he would back their decisions to the hilt. "I am with you," Modi told them at an informal post Diwali get together at his residence. Home Minister Rajnath Singh, Finance Minister Arun Jaitley , Urban Development Minister Venkaiah Naidu and others were present at the event. 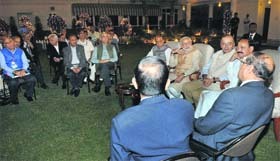 The PM, sources said, told the secretaries that he hadn't invited them for a 'sarkari talk'. The event soon transformed into a discussion on policies and priorities of the government. It was after some bureaucrats referred to the successful launch of PM's Clean India Mission that Modi told them to keep "cleanliness" at the heart of every decision. Modi told secretaries to spend bulk budgets in a focused manner before the onset of monsoon. "There was stress on focused and persistent spending rather than accumulation of funds till the end of the financial year," said a source. On policy making, the PM asked babus to "innovate and think out of the box". He promised them all support for "bonafide"decisions. . A bureaucrat said the event was informally structured with several babus speaking their mind openly. Some even told Modi that they found it easier to talk to him than they did to Chief Ministers. Modi had met secretaries immediately after he took charge as the Prime Minister. He has been meeting bureaucrats one-on-one basis to discuss sector-related policy and future roadmaps. Reopening the park, a UNESCO World Heritage Site, the minister spoke highly of the efforts of the forest staff especially the frontline staff and the cooperation of the people living in the proximity of the park in scripting one of the most successful story of wildlife conservation on the globe despite odds like constant threat from well-armed rhino poachers. Conservation efforts in Kaziranga National Park date back to 1905 when there were only 20 pairs of rhinos in the area. In the last census carried out in March 2013, total 2,329 rhinos were in Kaziranga landscape. In 2011, the rhino population in Kaziranga National Park was 2,290. The park also boasts of the highest density of royal Bengal tigers. The number of tigers in the park stood at 118 when last recorded. Tiger census is carried out every year in the park since 2011. It was a majestic sight to behold when the park’s elephants meant for tourists were lined up for the opening ceremony much to the cheer of the crowd of tourists and forest staff. All these trained elephants were subjected to thorough medical checkup during the past week. A senior park official said that all tracks and wooden bridges within the park that were damaged due to floods earlier this year had been repaired before the onset of the tourists season. Kaziranga National Park has five main ranges — Agratoli, Bagori, Burapahar, Kohora and Uttarpara. The 858-sq km national park was visited by record number of 1,25,911 tourists during the last season of 2013-14, including 6,922 foreign tourists, mostly coming from European countries and the US. The number of domestic tourists registered an increase over the years — from 53,640 in 2007-08 to 1.19 lakh in the last tourist season and number of foreign tourists visiting the park increased from 3,772 in 2003-04 to 6,922 in 2013-14. While 30 trains will remain cancelled, four will be partially cancelled and two trains would be diverted keeping the foggy weather conditions in mind,” said a senior Railway Ministry official. Dibrugarh Rajdhani, Ludhiana Shatabdi and Moga Shatabdi are among 30 trains which will remain cancelled during this period. Some of the north bound trains coming from Hatia, Sitamarhi, Sharasa, Ludhiana, Sealdah and Howrah will be affected during the winter as heavy fog is expected during the period, said the official. Trains like Jharkhand Sampark Kranti, Lichhivi Express, Garhwal Express, Ujjaini Express and Mahananda Express are being cancelled. Brushing aside China’s reservations to its plans to develop infrastructure along the border, government today said it has every right to undertake such projects in Indian territory and no one can stop it. “We will do certain infrastructural activities which have not been done in the last 60 years. The Chinese should not have a problem with my statement.... They cannot stop me from doing my work,” Minister of State for Home Kiren Rijiju told reporters here on the sidelines of a function here. China had recently reacted sharply to a statement by Rijiju that India was planning to construct a road along the international boundary from Mago-Thingbu in Tawang to Vijaynagar in Changlang district of Arunachal Pradesh to match China’s road infrastructure across the McMahon Line. “There is a dispute about the eastern part of the China- India border. Before final settlement is reached, we hope that India will not take any action that may further complicate the situation,” a Chinese Foreign Ministry spokesman had said. Rijiju today said he was only referring to the government’s plans to improve border infrastructure within India’s territory and not in Chinese territory. India will tomorrow start destroying its stockpile of seized illegal wildlife articles, including tiger pelts and ivory, to demonstrate the country’s commitment towards protection of its flora and fauna. The illegal wildlife products to be pulverised and burned by the Ministry of Environment and Forests at the Delhi Zoo include those derived from tigers, elephants, leopards, lions, snakes, deer, mongoose, owls and shells. Over the coming week, Rahul will meet top Congress leaders to discuss the measures required to be taken for course correction to ensure revival of the party that faces two elections immediately and other important ones, including Bihar in 2015. The exercise began last evening with Rahul meeting a select group of party strategists, including former Punjab CM Capt Amarinder Singh whose presence was critical given the strong rebellion brewing against Punjab Congress president Partap Singh Bajwa. Though Amarinder was not available for comment, a source familiar with the goings on told The Tribune today that state-specific remedies were sought at Rahul’s meeting and leaders were free to talk about states-related issues. “Leadership issues are critical. In Haryana, where we were relegated to a third spot, there was a long standing dissent against former Haryana CM Bhupinder Singh Hooda. Questions will have to be answered about how to sort out leadership challenges,” the source said. Amarinder has reportedly expressed concerns over the leadership crisis in Punjab. More than 24 farmers were injured in police lathi charge and around six policemen hurt in brick-batting when protesting farmers clashed with the police at Gokul barrage in Mathura today. 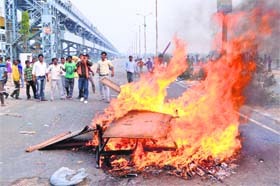 Farmers set ablaze two Uttar Pradesh state transport buses and blocked traffic causing major hardship to commuters. The police had to resort to lathi charge to disperse the protesting farmers. Under a previously announced protest dharna under the aegis of Bhartiya Janata Yuva Morcha, farmers had collected at the Gokul barrage, 2 km away from the district headquarters, to demand compensation. In 2003, the Gokul barrage was built. The farmers whose land had been taken over for the project are yet to be compensated. After the building of the barrage, sizable fields near it are submerged every year, damaging the crops. Farmers had announced to sit on a dharna today demanding compensation for both. What angered the protesting farmers was that the district magistrate was not present on the spot to hear them out and announce a plan for compensation as had been reportedly agreed upon. To draw attention to their protest, the farmers first blocked traffic and then set afire two passenger buses stranding the commuters on the highway. The pitched battle between the policemen trying to lift the blockade and the farmers left many wounded on both sides. Agra Range IG and DIG rushed to the spot. The situation was brought under control but was still reported to be tense. The controversy broke out after the transfer of Rs 609 crore from AP Building and Construction Workers Welfare Board to Andhra Pradesh. The Board is a joint property of both governments, as per the provisions of the AP Reorganisation Act, and its funds are to be shared in 58:42 ratio between AP and Telangana. The funds were transferred by AP Assistant Labour Commissioner PV Murali Sagar to a bank in the coastal Andhra city of Vijayawada. The move has angered Telangana Government which slapped a criminal case against Sagar, an IAS officer, for violating the rules and diverting funds without the consent of Telangana government. The issue further deepened the rift between the two states with Telangana Government asking the banks to freeze the funds of common institutions that come under the purview of Section 8, 9 and 10 of the AP Reorganisation Act. The city police registered cases of cheating and breach of trust against Murali Sagar and took them into custody inside AP Secretariat premises last evening, a development that sent shock waves among the official circles. AP Chief Secretary IYR Krishna Rao met Governor ESL Narasimhan and complained against the action of Telangana Government in ‘detaining’ its labour official. The Chief Secretary clarified that AP did nothing wrong in transferring the funds from a bank account in Hyderabad to another in Vijayawada. “The account belonging to the labour department has Rs 1,463 crore. Of this, AP’s share is Rs 850 crore and Telangana’s 613 crore. AP only transferred the cash from its share,” the official said. The Governor summoned Telangana Chief Secretary Rajiv Sharma and Director General of Police Anurag Sharma and directed them to submit a report on the unsavoury episode. Communication adviser to the AP Government P Prabhakar sought the intervention of the Centre on the issue. “We have not taken a paisa of theirs (Telangana’s). The whole board is still under the jurisdiction of AP as bifurcation and division of the board’s assets are yet to take place,” he said. AP Labour Minister Atchan Naidu demanded an apology from the Telangana Government over filing of criminal case against AP official. Chowdhury was heading a delegation of 12 MLAs and other leaders to visit Makra where three persons were killed in a clash between the Trinamool Congress and the BJP on Monday amid Section 144 of the CrPC imposed in the area. The prohibitory orders were cited as the reason for not letting them in by the police who stopped the Congress delegation at Chaumondalpur, about 3 km from Makra. A scuffle ensued as Congress workers tried to break police barricades. Chowdhury, a former Union Minister, later requested the police and local administration to allow a small team to enter the village without defying the prohibitory orders so that they could interact with the villagers who were affected in the clash on Monday. But the police and the local administration ruled out their request, which led the delegation to observe a sit-in. Chowdhury later addressed a gathering. “We will return after a week if the police fail to keep the assurance given to us,” he said. He accused the TMC government of trying to “gag the Opposition with brute force” and cover up the incidents. Six parties — the Communist Party of India (Marxist), CPI, All India Forward Bloc, Revolutionary Socialist Part, CPI (M-L) Liberation and Socialist Unity Centre of India (Communist) — decided to conduct a week-long protest from December 8. The other issues are to “stop infiltration of the RSS and the Hindutva ideology in education, public broadcasting, media and other institutions of the state”, stop the “love jihad” hate campaign and other forms of communal propaganda; stop attacks on minorities and their right; fight violence against women and all forms of gender oppression; and fight against atrocities on Dalits and caste oppression. The price of aviation turbine fuel (ATF), or jet fuel, at Delhi was cut by Rs 4,987.7 per kilolitre, or 7.3%, to Rs 62,537.93 per kilolitre, oil companies announced today. This is the fourth reduction in jet fuel rates since August. Rates were cut by almost 3% or Rs 2,077.62 per kilolitre on October 1. The declining international oil prices have made imports cheaper, resulting in price reduction. The rates vary because of differences in local sales tax or VAT. The fire, which broke out at 10 pm, engulfed the two storey structure within no time, making it impossible for the six fire tenders to douse the flames. However, with the building going up in flames in no time, the efforts of the fire and Army personnel proved futile. Badal was accompanied by Punjab Deputy Chief Minister and Shiromani Akali Dal (SAD) president Sukhbir Singh.